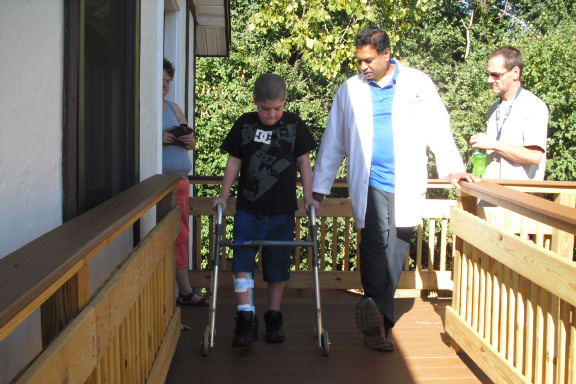 At RAM Orthotic and Prosthetic Lab, our patients’ care and well-being are of the utmost importance. Whether you are in need of an orthotic device or a prosthesis, our experienced team will do whatever it takes to help you regain your independence as quickly as possible. Learn more about our comprehensive orthotic and prosthetic services. We care for patients who are in area hospitals, as well as seeing patients at our Capital District-area clinic locations. Before making your initial appointment with our office, you will need to get a referral and/or prescription from your doctor as well as any doctor’s office notes that will help in planning for your care, assessment, fabrication, fitting, and adjustments. It also is a good idea to call your insurance company before your first visit to find out about your plan’s benefits coverage. This will help to establish meaningful dialogue in coordinating and successfully obtaining the coverage that you are entitled to. Please see below for a list of our in-network insurance companies. It is helpful to wear loose-fitting clothing and comfortable footwear to your appointments. During the first visit, all patients–whether in the hospital or in one of our outpatient offices–will have a one-on-one assessment with our specialist to discuss your unique case and determine your individual care plan. It may be helpful to bring a friend or family member with you if you have mobility issues. Orthotics include braces and other devices that can assist the body with support, proper alignment, and/or healing. For orthotic patients, your initial appointment will last approximately one hour. Ram Madho, CPO, our highly-trained orthotic expert, will perform a gait assessment and/or an evaluation of your current physical condition. We will discuss the various brace options, including off-the-shelf and custom orthotics, and you will have an opportunity to try out different types, if available. If you are in need of a custom orthotic, depending on your insurance coverage, we may be able to do your measurements and casting during the initial visit. Creating a cast mold allows us to establish a baseline for fabrication of your custom-made orthotic device(s). We fabricate custom orthotics in our on-site lab, and your device should be available in about two weeks, at which time we will schedule you for a fitting and education on proper use of your device. You will then follow-up with us periodically to ensure the orthotic is still properly fitted and performing its function. Prostheses are devices that replace a missing body part. Ram Madho, CPO, our prosthetist, has over 20 years of experience in working with patients who have congenital conditions or have undergone an amputation. His background in nursing and his work in hospitals honed his extensive knowledge of wound care and rehabilitation techniques. A compassionate caregiver, Ram is expertly trained in custom prosthesis measurement, molding, fabrication, fitting, and coordination of care with other rehab professionals. While it isn’t always possible, it is preferable that we meet with you for an evaluation prior to your amputation as this allows us to put a plan in place for your post-operative care and rehabilitation. We also can educate you on what to expect after your surgery, how to care for your wound, how to control swelling, and what is normal. Having an experienced guide to help you through this process is a valuable asset. Especially when you are lying in the bed after amputation, it is both comforting and helpful to know what the next step is to get you back to a functional level of independence. Approximately 6 to 8 weeks after your surgery, if your wound is healing as expected, we can begin the process of fitting you for a prosthesis. During your initial appointment, which will last approximately one hour, we will do a comprehensive evaluation of your anatomical condition and discuss the different types of prosthetics that are available for your unique needs. Most patients will get an initial or preparatory prosthesis, which serves as a learning tool and prepares you for your custom device. We will be by your side, helping you through every stage of the process as you learn to use your new prosthesis and regain your independence. We will fabricate your custom prosthesis in our on-site lab, and your device should be available in about two weeks, at which time we will schedule you for a fitting and education on proper use of your device. You will then follow-up with us periodically to ensure the prosthesis still fits properly and is performing its function. For out-of-network providers, the patient will be responsible for the out-of-network deductible or co-insurance amount. If your plan does not have orthotic or prosthetic coverage, you will be financially responsible for your care and device. It is our objective to help our patients meet their functional goals, so in most cases, we will work with you to set up a payment plan if your insurance does not cover your orthotic or prosthetic device.